Newsletters contain the most concise discussion of current issues. Articles generally cover the same issues but in more detail. Brenda Adelman is the author of both Newsletters and Articles. Protest alert for permanent river low flow! Over a year ago, the National Marine Fisheries Service (NMFS) issued a Biological Opinion (BO) to institute management changes in the Russian River that would protect three fish species of concern: Coho and Chinook salmon and Steelhead Trout. While many support efforts to save the threatened and endangered species, the Order did not address many project impacts, such as water quality, recreation and the local economy. Furthermore, much of the project is a long-term experiment and results may not be known for many years. We’ve had a lot of rain this winter, or at least a normal amount. We should be relieved of worrying about next summer’s river flows, right? Wrong! More money for less water…. Public Environmental Review Process to Begin…. SCWA is now beginning the environmental review process needed to petition the State Water Board to PERMANENTLY lower flows to 70 cubic feet per second (cfs), a 45% decrease from what is normally a minimum of 125 cfs. Decision 1610 (D1610) is the State Law they expect to alter. 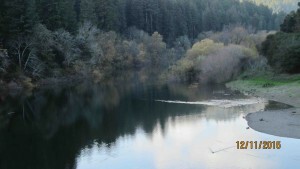 Lake Mendocino and Lake Sonoma are the fullest they have been in years and everyone is sighing relief at the expectation of having normal water supplies this year. Folks are grateful that this will be a summer when gardens can be watered without guilt. But sorry, the lower river is expected to get low flow again anyway!